I am a former curriculum director who loves technology. It’s a fairly new love affair. We’ve been a serious item for almost six years now. Here’s the backstory: I began teaching in 1998 when my students would get to go to the computer lab once a week for a lesson planned by the librarian. I was pretty much on crowd-control during these lessons. I add that to say that I’m a self-taught tech integrator who was definitely not born a digital native. As my teaching progressed, so did my time leading lessons in the computer lab. But technology available to my students in the classroom was minimal, at best. My last year in the classroom (2010-11), I had my teacher computer and three old iMacs for my students to use. They could basically only use them to play games and take Accelerated Reader quizzes. I was a pro at making copies on transparency sheets to use on my overhead projector. My weekly computer lab trips were usually reserved for publishing writing pieces, typing practice, or math fact drills. We are, obviously, not talking about any innovative technology infusion. After I became the curriculum director for our district in the fall of 2011, I quickly realized that we needed to catch up with some forward-thinking districts when it came to tech integration. Our elementary schools were just getting equipped with SMART boards that year. Our math teachers at the high school had Promethean boards and doc cameras. The other middle and high school teachers had LCD projectors. That was as tech-rich as our district got. In that year, I started a blog, joined Twitter and LinkedIn, and began immersing myself in learning about edtech solutions for transforming instruction. I followed edtech leaders, subscribed to blogs, read articles, and attended conferences on the subject. At one point, our Director of Technology visited my office and candidly said, “You know, when I heard you were named our new Curriculum Director, I was a bit worried.” I just laughed, because I knew he was referring to the lack of technology integration I previously had in my classroom. He went on, however, to assure me that he had changed his mind and knew they’d made the right decision when they hired me. That only happened because I was motivated to further my own learning and stretch my thinking when it came to teaching and learning. The second year in that role brought about even more growth. Our district was wanting to move to a 1:1 environment for our 5th-12th grades for the following school year. That led to me being appointed as the 1:1 steering committee chair to conduct research, explore options, and learn as a team in order to make the right decisions for our students. During another office visit from our DoT, he joked that he’d just read an article about how tech directors and curriculum directors should be married. We laughed about this, but the point was, and still is, completely valid. Technology and instruction are no longer separate entities in schools. These two facets of a student’s education must work seamlessly together. I was fortunate to work with a DoT that understood and respected that fact. I was the one who got to attend instructional technology trainings and workshops. I was the one who led that integration into our classrooms. And being a former classroom teacher, the current teachers were more open to the idea of change coming from me. But it took both departments working together to provide devices and ongoing professional development in order to sustain lasting change. Fast forward a couple of years, and I am still working within the technology-curriculum marriage. As a consultant, I often get to work with districts who purchase Dell laptops and/or Chromebooks for their teachers and students. I get to go in and provide training for teachers and administrators, and then work one-on-one in job-embedded professional development with them multiple times throughout the school year. I like to say that Dell is the foot in the door, but the true work lies in transforming instructional practice. 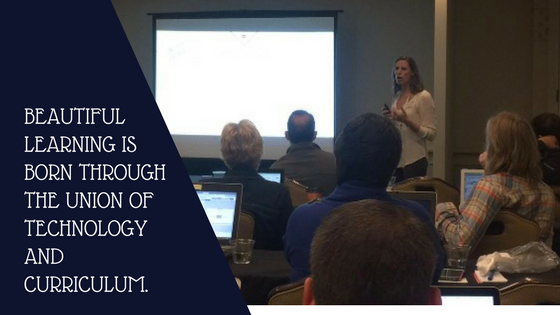 I show teachers how to use technology to leverage rich resources and learning opportunities to provide their students with personalized learning experiences in student-driven environments. I don’t just give them a list of good websites. I don’t just teach them on a specific student-centered learning strategy. I marry the two together, and beautiful learning is born through this union. This entry was posted in Education, Leadership, Professional Experiences, Technology and tagged curriculum, edtech, educational leadership, technology. Bookmark the permalink.